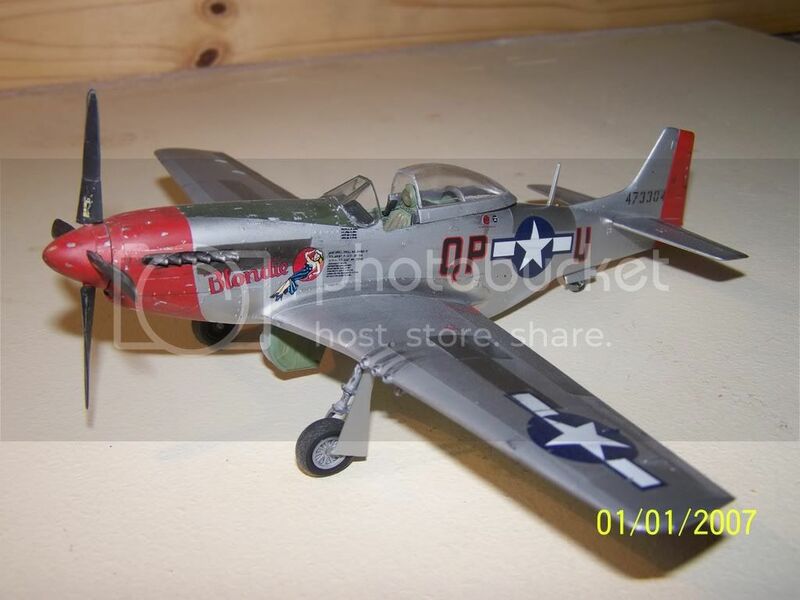 Nigel Julian (Lampie) gives us an article explaining how he goes about painting a model with a metal finish. Well done. This should remove the fear of NMF for many who haven't tried one yet! I was unaware of being able to clean up with alcohol, i've always used laquer thinner. When I made aircraft with a metallic finish I always found it very hard to to apply the anti glare panels, I admit this was before I started using an airbrush, so my question is, apply the Anti glare first, mask off and spray, or spray the metallic finish and then mask and spary? Sorry for the late reply,Ive only just seen this. I always apply the metallic finish first and then mask/spray over the top of that. The blue bands on the Thunderbolt MKII were done this way. After the wash was applied I then masked the metallic finish around the bands and matt varnished them. I found this to be very helpful , I have always used Testors model Master aluminum buffing paint . Im glad this features helped a few people, and we may even see some NMF planes in the forums soon that are a direct result of it. That'll be "job satisfaction" indeed. They look fantastic,but being a fan of brushwork (and being too lazy to muck about with airbrushes !) i`ve found that you can achieve a fairly good finish using well thinned tin paint and a brand new brush,applied to a clean model of course. 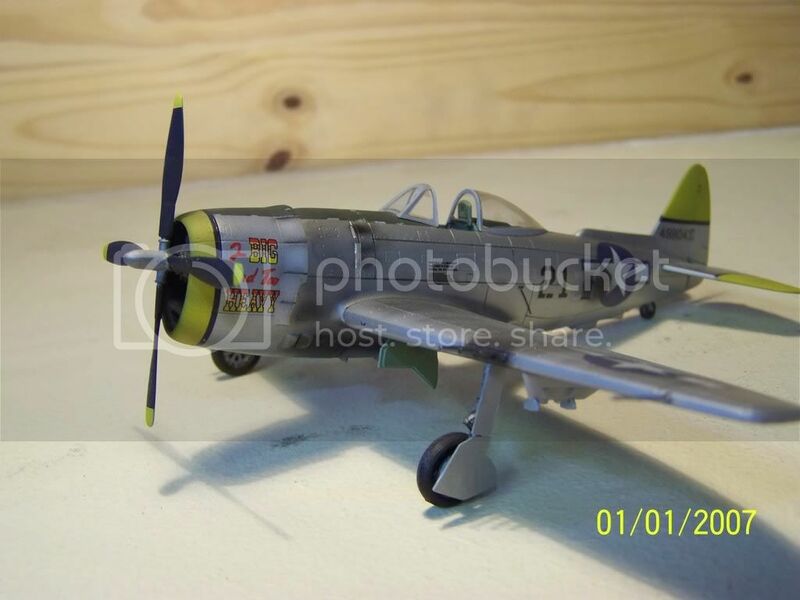 Having said that i`m gonna have to look into buying an airbrush coz i`ve developed a bad habit of collecting 1/32 scale models !! Here's some scans of the instructions that I got wrapped round a bottle of Alclad once. 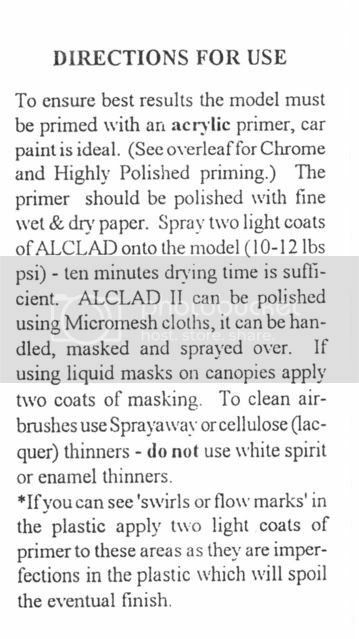 Hmmm I never knew you used alcohol to clean your airbrush after using Alclad.. Might give it a go now. Yep, Isoproyl alcohol works a treat. I also use it if I need to strip a panel and repaint. Mask off the area along the nearest convenient panel lines using Tamiya tape, and very gently rub at the paint using a cotton bud/Q-tip just dampened with isopropyl. At the edges, swipe from the masking tape onto the area being stripped and not the other way round. This way you don't force isopropyl under the masking tape. 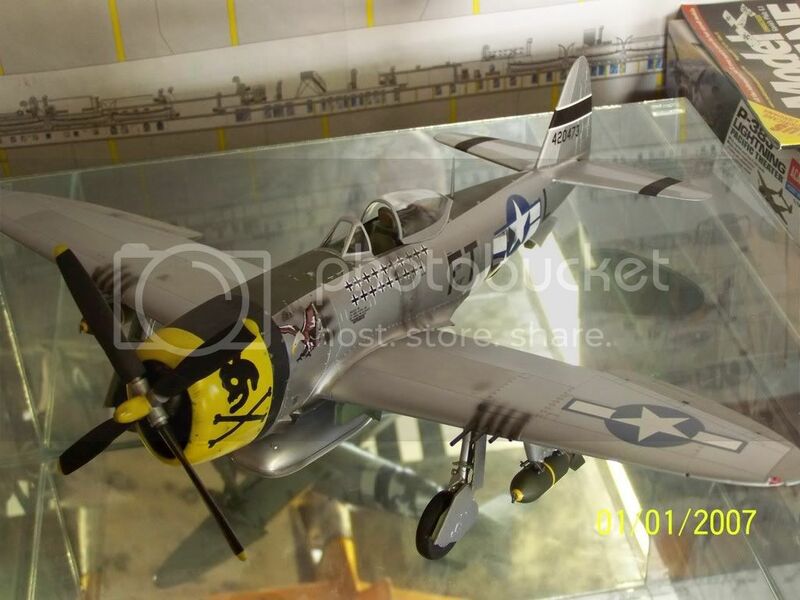 On this P-47, most of both wings and a section of the starboard fusalage were stripped (as far onto the build as the decal stage) amongst many other individual panels, and repainted. A bit scary the first time you attempt it but once you've done it a couple of times you get used to it. Nigel, really enjoyed your article on NMFs. Just loaded with sound, basic methods, and advice. 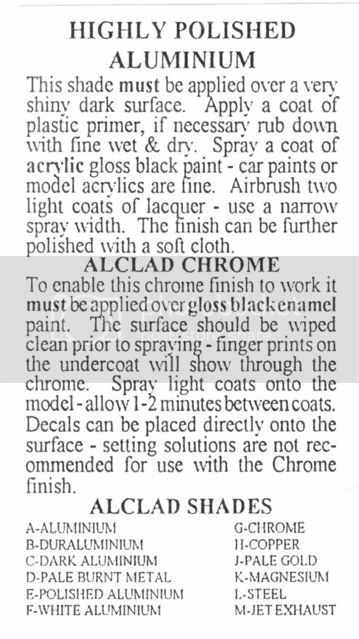 I can confirm the alclad black primer is bad news - didn't ever cure in my case either. And for what it is worth, I have used the tamiya spray bottle gloss black as a primer layer (which is a lacquer base, not acrylic) under alclad metallics with good success - but you do have to keep the alclad coats very light and build up in coats, as nigel said, or the alclad might attack the lacquer (hasn't happened to me yet tho). I'm glad this thread has been bumped up again, I hope it encourages a few more folks to try the NMF schemes. I always use Tamiya black semi-gloss acrylic as my Alclad primer and have never had any problems. I also mask and spray the anti glare panels and stripes over the Alclad after just an hour or so drying, usually using "post-it notes" as the masking, they are extremely low-tack and never lift the paint underneath. Blimey, is it really over 5 years since I wrote this article?? It takes me almost that long to finish a model these days! You have no idea how much encouragement that article did for me. I will now face painting my bubble top with far less fear than I had before. Thanks Nigel, Joel and Jessica for all the advice you guys give so generously.